Minimising gaps in a building’s fabric delivers many benefits, from reduced heating costs to improved acoustics, comfort levels and occupant well-being. But what does the term airtightness actually mean? Chris Roughneen, Technical Manager at Isover examines the issue. Ensuring a new home has a reasonable level of airtightness is essential to improve the energy efficiency of the building, which in turn will provide future occupiers with a comfortable environment to live in and reduced energy bills. 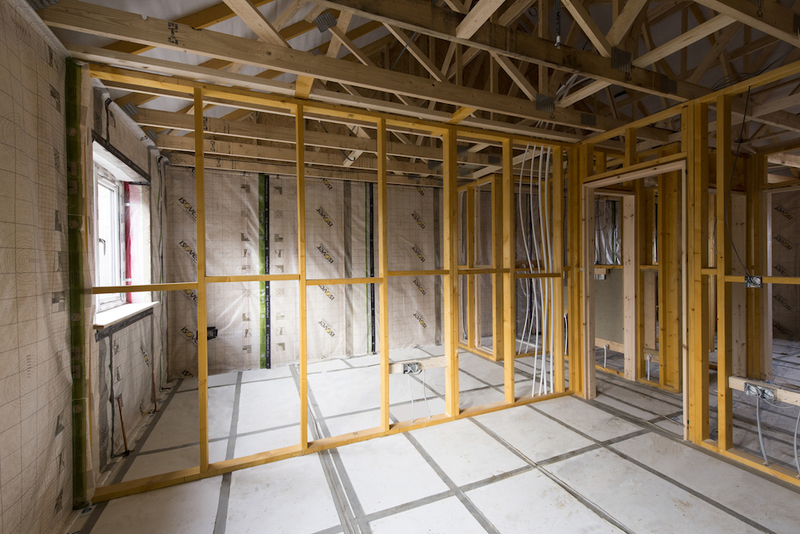 Even the most well-insulated home will lose heat if airtightness levels are not addressed – it’s similar to filling a bath, without putting the plug in. In fact, poor airtightness can be responsible for up to 40% of heat loss from buildings. But what is it? Airtightness is the measure of uncontrolled ventilation through gaps and cracks in the building envelope and it is vital that this is minimised, to ensure occupant comfort and wellbeing. In the UK, the level of airtightness is measured as air permeability in the unit m3/h.m2 at 50Pa (q50). This value refers to the volume of air in m3 that can flow per hour through each square metre of the building envelope at a pressure differential of 50 pascals. Within the Building Regulations, energy efficiency targets for new dwellings are key; providing an airtightness value for a guideline ‘notional building’ as well as an absolute limit. In England and Wales, the limiting value stated in Part L1A of the Building Regulations is 10 m3/h.m2 at 50Pa, whereas the value applied to the notional building within SAP is 5 m3/h.m2 at 50Pa. This means that there is a case for aiming for an improved level of airtightness to make SAP compliance easier. In Scotland, the term Infiltration Rate is used instead of Air permeability, but the limiting factor is the same as it is in England and Wales. However, the value applied to the notional building within SAP is slightly different at 7 m3/h.m2 at 50Pa rather than 5 m3/h.m2 at 50Pa. To demonstrate compliance with these standards and regulations, a number of ‘as-built’ properties must be tested, and the actual number of properties that require testing is governed by the overall size of a development and the number of different building types situated within it. With the above regulations in mind, it is highly recommended that airtightness levels and ventilation are carefully considered at the beginning of a project. 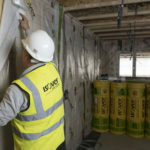 Airtightness is achieved by designing and installing a continuous air barrier around the heated volume of the building. This air barrier will normally be on the warm side of the insulation. The junctions between different materials in the air barrier should also be well sealed and penetrations should be minimised and thoroughly sealed where they cannot be avoided. The ventilation strategy must also be considered at the same time as airtightness levels: too much air leakage leads to draughts, heat loss and wasted energy, whereas too little air infiltration can result in inadequate ventilation and poor indoor air quality. According to the Energy Saving Trust, the total ventilation rate for a home should be between 0.5 and 1.5 air changes per hour. This includes controlled and uncontrolled ventilation. As such, the correct specification (and subsequent installation) of an airtightness management membrane is key. A traditional vapour control layer (VCL), such as a polythene sheet, can create an airtight finish, however, in practice, it can be very difficult to achieve a good installation on-site. 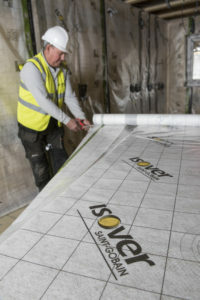 However, Isover’s new Vario system has been designed to make the installation as fast and easy as possible. 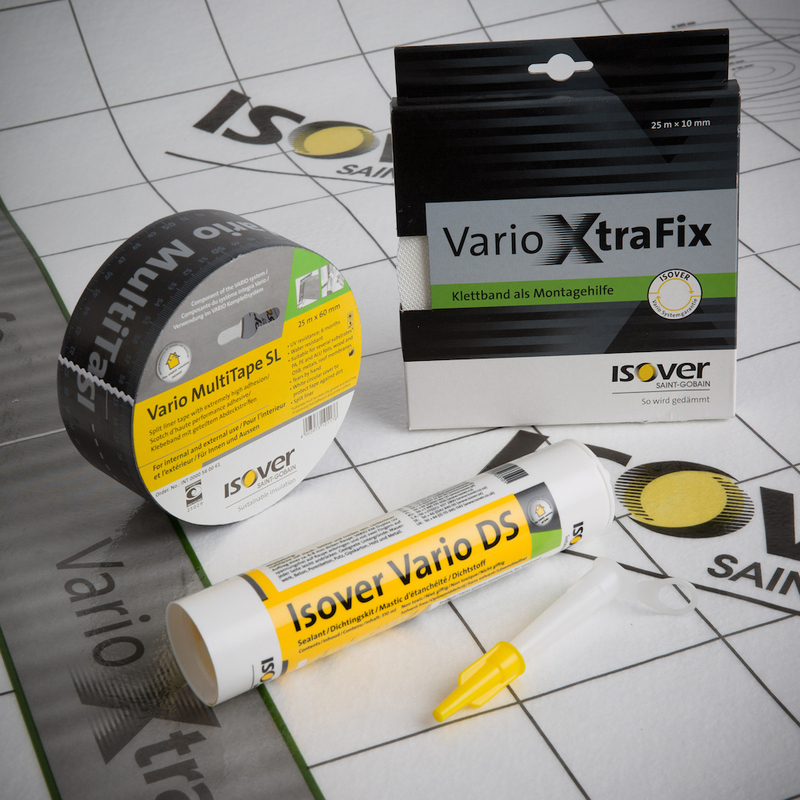 In particular, the Vario XtraSafe has a unique adhesive ‘hook and loop’ fixing system, which means that a single contractor can effectively install the membrane on site. The membrane is semi-transparent and pre-printed with 100mm squares to help with cutting and gauging overlaps for ease of placement, which further boosts the speed of installation. In addition, the Vario XtraSafe system includes a wide range of accessories to help ensure an airtight seal around edges and penetrations such as windows, pipes, cables and sockets. By designing in airtightness at the beginning of a project, housebuilders can rest assured that they have delivered an energy efficient home that will provide occupiers with a comfortable environment to live, work and play in, while improving their well-being.